A dominant trope of conversations about the circumpolar regions is the notion of dispruption and change. The focus on the Arctic as a region under duress from natural transformations can be observed, for example, in the pages of newsmedia, the agendas of political and scientific gatherings, and the public imagination, more broadly. 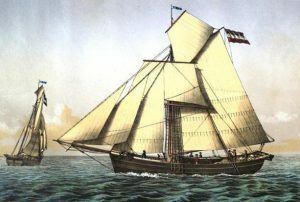 It does not come as a surprise then that beyond the confines of historically-minded scholars and knowledge-holders, current changes and developments in the circumpolar world are rarely contextualized within the longue dureé of polar history. Instead, a historical amnesia privileges a presentist conception driven by an accelerated awareness of the environmental changes in the polar regions. In turn, this portends to obfuscate what the nineteenth-century historian Jacob Burckhardt identified as “the recurrent, the constant, and the typical,”  in other words the continuities and legacies that continue to exert their grasp on the mental maps of actors in the regions today. The emergence of competing temporalities is a result of this phenomenon, disconnecting millenia of indigenous history and centuries of European and American activities from present conversations about the state and the future of the Arctic regions and its peoples. Schütte’s invocation of German polar history is a useful case to illustrate the entangled nature of knowledge production in and of the circumpolar regions. Early modern attempts to bestow the North Pole with meaning have been intertwined with questions over divine authority, power, and social status, the historical geographer Michael Bravo has recently shown. In 1524, long before the emergence of a German nation state, the Saxon Peter Apian, for example, popularized polar projection maps sought after by royal and commercial elites looking to grasp a relationship between celestial movement and terrestrial events. Rulership and power were closely connected to polar knowledge and the means used to produce such knowledge. During the nineteenth century, August Petermann stimulated debates about the nature of the Arctic. The enterprising geographer behind the First German Polar Expedition in 1868—Schütte’s vanishing point—theorized about the existence of an open polar sea and the extension of a land bridge across the Arctic Ocean, connecting Greenland and Wrangel Island. Aspiring to a Humboldtian universalism, Petermann brought scientific theories on topics such as ocean currents, ice distribution, meteorology or magnetism in conversation with spatial representations of the polar sea. His geographical work and advocacy, however, failed to win support from the newly unified German Kaiserreich in 1871 for a sustained program of polar exploration. 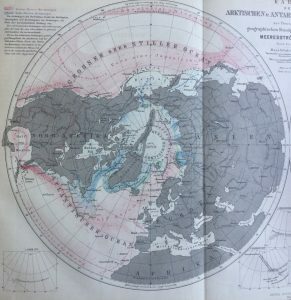 Indicative of the transnational nature of polar science and exploration at the time, Petermann’s theories received a warmer welcome in Austria-Hungary, Sweden, Russia, Britain, the Netherlands and the United States, inspiring scientific agendas and polar expeditions. Schütte’s history of Germany’s polar engagement was off to a rocky start. Dr. John Woitkowitz is a Postdoctoral Research Associate in the ERC-funded project Arctic Cultures: Sites of Collection in the Formation of the European and American Northlands led by Dr. Richard C. Powell at the Scott Polar Research Institute, University of Cambridge. For more information, visit http://www.arcticcultures.org and follow the project on Twitter @ArcticCult. RBB Inforadio, “Forschung in der Arktis,” 25.10.2018, https://www.inforadio.de/programm/schema/sendungen/wissenswerte/201810/25/277941.html, last accessed 5.11.2018. Jacob Burckhardt, Weltgeschichtliche Betrachtungen. München: C.H. Beck, 2018, 12. Michael Bravo, North Pole, London: Reaktion Books, 2019, 41-56. Hugo August Weller, “August Petermann als praktisch-organisatorisch tätiger Geograph. Bruchstück zu August Petermann und seiner Schule,” Dissertation, University of Leipzig, 1903, 44. Andreas Eckart and Albert Wirtz, “Wir nicht, die anderen auch,” in: Sebastian Conrad and Shalini Randeria (eds. ), Jenseits des Eurozentrismus. Postkoloniale Perspektiven in den Geschichts- und Kulturwissenschaften. Frankfurt a. M: Campus Verlag, 2013, 506-25. R. Andreas Kraemer, “Responibility for the Arctic from afar,” The Arctic Insitute, 27.11.2018, https://www.thearcticinstitute.org/responsibility-arctic-afar, last accessed on 17.01.2019.